This is part 1 of a 2 part blog on Thermal Mass Flow Sensor. We will describe the desired characteristics of a thermal mass sensor in Part 1 and Part 2 will discuss the operation of the 300 Series flow sensor (Patent #6,125,695) from Teledyne Hastings. A cutaway is shown in the image on the right. In a typical thermal mass meter, gas enters the flow meter via the upstream port which is attached to the process with a fitting (VCR, Swagelok…). Most of the gas will move through the bypass shunt; however, a certain fraction will flow through the thermal mass flow sensor. 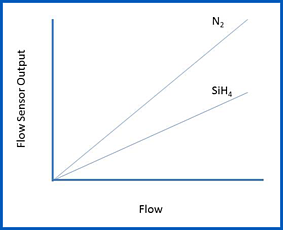 Note that the shunt is selected such that amount of gas moving through the flow sensor is approximately the same at full scale flow. The gas then exits the flow meter via the downstream port. Ideally, the thermal mass flow sensor would exhibit the following characteristics: first, it would be linear. What we mean by linear is that the sensor’s electronic output should be directly proportional to the flow rate moving through the sensor throughout its range. Linearity of the flow sensor leads to the second desired characteristic: accuracy. An accurate flow sensor can give the users the benefit of better gas flow measurement, control, and understanding of their system parameters. Before we move on with our desired characteristic list, we need to discuss a little about how linearity can factor into calibration. Typically, a thermal mass flow meter is calibrated in nitrogen (or in the case of very large flows, it may be calibrated in air). The output of the flow meter can then be scaled for use in other process gases. (In other words, the flow meter technician can calibrate a flow meter for use in a corrosive process gas like silane (SiH4) – without having to use silane). A linear flow sensor will retain its linear behavior as the gas is switched from the calibration gas (N2) to the process gas. Our next desired characteristic is fast response. 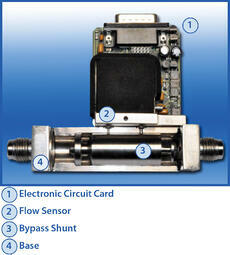 Ideally, the flow sensor would respond instantaneously to a change in the flow rate. Aside from the obvious benefit of instant real-time vision of the flow in a process, fast response becomes critical when the flow meter is coupled with a proportional control valve to create a thermal mass flow controller. Finally, we would like the thermal mass flow sensor to have a low pressure drop. A low differential pressure drop across the flow meter is ideal for leak detection and gas sampling applications. 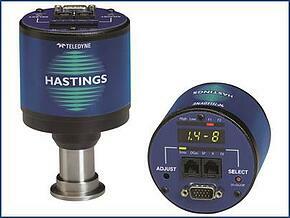 Teledyne Hastings' Thermal Mass Flow Sensors are used worldwide. For more information on on Best Practices for Mass Flow Controllers and Mass Flow Meters download our whitepaper. 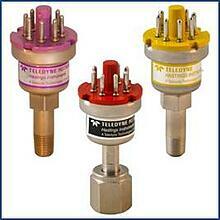 In our next blog, we will describe the sensor that is core to the Teledyne 300 Series of mass flow meters. We will also look at how the 300 Series thermal mass flow sensor addresses each of the desired characteristics described above. In the vacuum world, gauges can be characterized as being either “Direct” or “Indirect”. Direct gauges are so-called because they directly measure the force imparted on some surface. And since P = F /A (pressure equals force per unit area), the gauge is directly measuring the pressure. Some examples of direct gauges would include: Bourdon gauges, capacitance manometers, piezo-resistance gauges (we’ll talk more about this one later in this blog). Indirect gauges do not “directly” measure the force associated with the gas in the chamber. Rather, these gauges measure some property associated with the gas. For example, thermocouple vacuum gauge tubes measure the thermal conductivity of the gas which is a function of the pressure. As another example, ionization gauges measure the ionization rate of a gas which is proportional to the pressure over a several orders of magnitude. So, thermocouple gauges and ionization gauges can both be called Indirect Gauges. 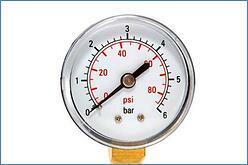 One of the key features of a Direct Vacuum Gauge is that it does not matter what gas in the vacuum is being measured. In other words, if the user has 20 Torr of Argon, Helium, Methane… or Air, a Direct Gauge will read the same pressure. To say it another way, Direct Gauges are said to be Gas Composition Independent. 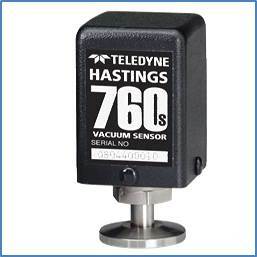 Teledyne Hastings provides a Direct Vacuum Gauge called the HPM-760S. (It is called the 760 because it will always provide very accurate results at atmospheric pressure.) 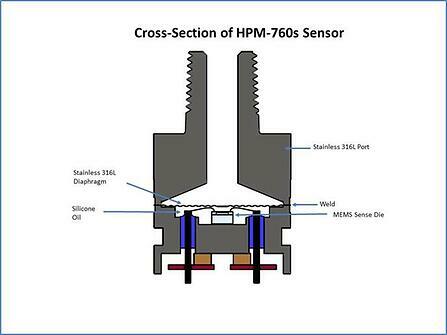 The HPM-760S utilizes a piezoresistive sensor. A cutaway drawing of this sensor is shown in the figure below. In this cutaway, we can see the micro-machined sense die. This die contains a resistance bridge that is made up of piezo-resistors. In a piezoresistor, the resistance changes as force is applied. The resistance bridge sensor is itself in contact with silicone oil that transmits the force from the gas in the vacuum system to the sensor. And, one of the most important things to observe about this sensor is that the only wetted material actually exposed to the gas in the vacuum chamber is 316L Stainless Steel. So to summarize, the gas molecules in the vacuum system exert a force onto the stainless steel diaphragm which in turn imparts a force on the piezo-resistive sense via the silicone oil. One last thing to mention about our cutaway drawing: the sensor of the HPM-760S is referenced to vacuum. This type of arrangement gives ABSOLUTE readings. Other types of pressure sensors can be referenced to atmospheric pressure (GAUGE readings) or can be connected to another part of the process stream (DIFFERENTIAL) readings. The HPM-760S is a DIRECT, ABSOLUTE, vacuum gauge. It is an excellent gauge for use on systems that are evacuated using a diaphragm pump. These types of pumps typically operate in the region between a few Torr and atmosphere. And, as mentioned previously, the HPM-760s has only stainless steel exposed (wetted) to the gas in the vacuum chamber. In other words, any gas (including corrosives) which is compatible with stainless steel will be compatible with the HPM-760S. The HPM-760S takes the output from the piezo-resistance bridge and amplifies it for the convenience of the user. At time of order entry, the user can select from four linear outputs. 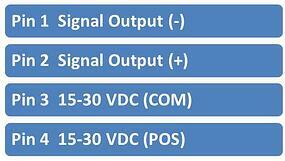 Two more quick notes about the analog output: First, selection of the 0-10 VDC version makes the conversion from voltage to pressure trivial. As a specific example, at 760 Torr, the voltage output is 7.60 Volt – SIMPLE. Second, the 4-20 mA output is a good selection in industrial environments that might have lots of electrical noise/interface or where the pressure signal must be transmitted long distances (>25 feet or 10 meter). The HPM-760s is very easy to use. See the image below. Two wires (Pins 3 & 4) are used to provide power to the HPM-760S. The two other wires (Pins 1 & 2) provide the linear output. So the HPM-760s can be used as a stand-alone vacuum gauge. In some cases, a user might like the convenience of having a readout preconfigured for the HPM-760S. 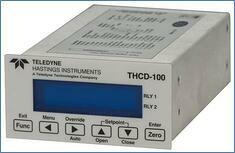 The THCD-100 (shown below) can be quickly attached using the CB-760S-THCD cable. In this scenario, the user not only gets a power/display module, but the THCD-100 will also provide dual process control relays. The THCD-100 can be easily connected to a computer or PLC via RS232. And finally, by using the DisplayX software (free) for the THCD-100, the user can also easily collect and log data to a spreadsheet. This blog was prepared by Will (Iron Man) Harrison and Doug Baker. Will runs at least two marathons per year – this Fall, Will is going to run his first New York City Marathon.